Construction of a Titration Curve. Experiment 5. Construction of a Titration Curve. The range of pH values encountered in aqueous solution is from about -0.5 to about 14. Since the scale is exponential, a decrease in pH of 1 unit, in effect is a tenfold increase in hydronium ion molarity. It is therefore very useful for monitoring a neutralisation reaction. The measurement of pH is simplified by the use of a pH meter which relies on the development of a potential difference between the two electrodes, one of which is sensitive to hydronium ions. 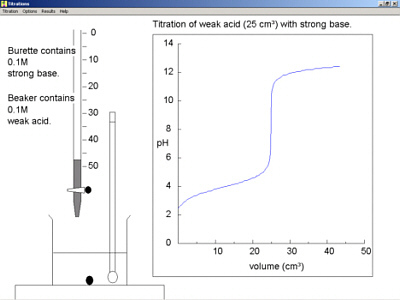 In this experiment, the titration curve for a neutralisation reaction will be drawn and the curve will be interpreted on the basis of ionic theory. Switch on the pH meter and allow it to warm up for about five (5) minutes. Rinse the electrode well with distilled water and allow to drain, checking that the temperature dial of the instrument is set at room temperature. Into the beaker provided, place some of the pH 7 buffer (sufficient to cover the electrode) and adjust the meter control until it reads the correct pH. Finally, rinse the electrode assembly and allow it to stand in distilled water. Fill the burette with reagent X and pipette 25 cm3 of reagent Y into the reaction beaker (100 cm3) containing the pH electrode. Read the pH and then add the solution from the burette 1 cm3 at a time, mixing well. Check the meter with the pH 7 buffer at regular intervals. Record the pH until further addition of reagent produces only regular small changes in pH (the solution combinations have been chosen to require no more than 10 cm3 of reagent in the burette for completion of the curve). Roughly plot out the curve of volume of reagent added against pH (pH should be the vertical scale) and examine it to find regions of the curve which exhibit a large slope. You should plot the pH after each addition from the burette. Remeasure the pH/volume curve more accurately over these regions by adding the solution in the burette in much smaller portions (i.e. in increments of 0.10 or 0.20 cm3 ) until you are quite certain of the pH and volume of added reagent at all points of inflexion. (c) The pH and volume of added reagent at any inflexion point(s). 1. What information can you obtain about the chemical reaction taking place? 2. If you knew the concentration of the solution in the burette, would it be possible to determine the concentration of the reagent in the beaker from your pH curve? If it is possible, determine the approximate concentration using the data given for the solutions you used. If the answer to question 2 is yes, could you use an acid-base indicator instead? Which one or ones could you use?